If you saw the crazy star top I got yesterday you might think I am crazy. I took it apart and fixed it …and it was very revealing. 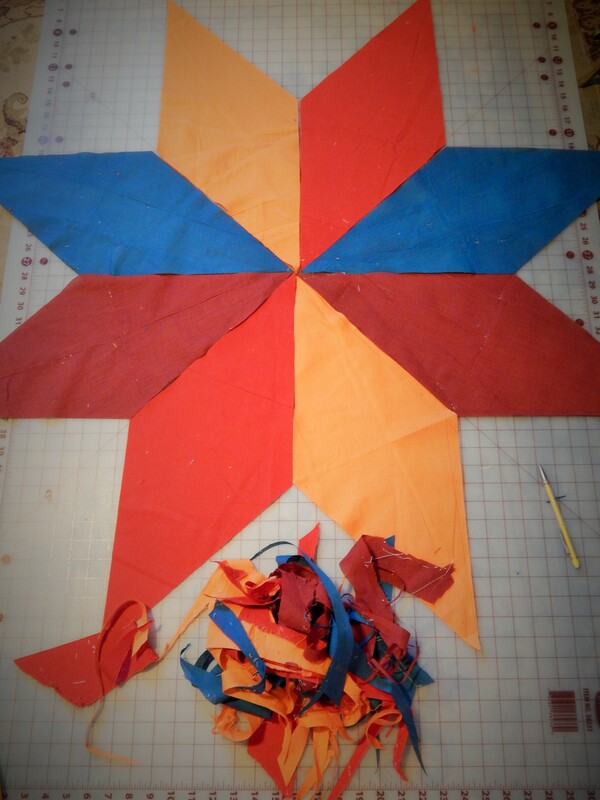 First I took of the border (I left that as it is and just took out the star) and then took apart the star. Before I show you what I found lets talk some geometry. Thanks to Mrs. Barron, my geometry teacher from over 30 years ago, I do know some geometry facts. There are 360 degrees in a circle so I want to make a star with 8 points I must divide 360 by 8. that gives me 45. so I need 45 degree diamonds to make an 8 point star. Now lets look at the pieces once I took the star apart. The problem becomes apparent when I look at the pieces. The angle is wrong. They are very poorly cut and not at all accurate but they are also 15 degrees off. These are closer to 60 degree diamonds and doing the math 60 x 6 = 360 so only 6 of these could possibly fit in a star…..but the maker was determined to make it with 8 so they forced them in. Here are the other 4 and they were cut in odd ways in an attempt to make it fit. 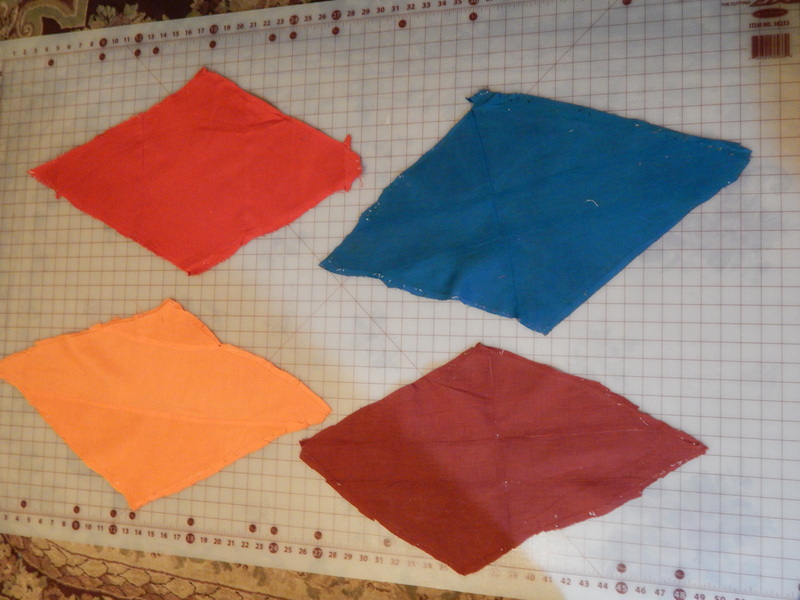 I had to cut them to the correct size…..I made them as large as I could, using the correct angle …. here they are with the trimmings. and the setting triangles were perhaps the most laughable. I re cut the squares and used some old fabric that was a good match to make the triangles. and then I set in the squares and triangles. Now to do the borders. I placed the star in the center of the border to show what a difference there is. 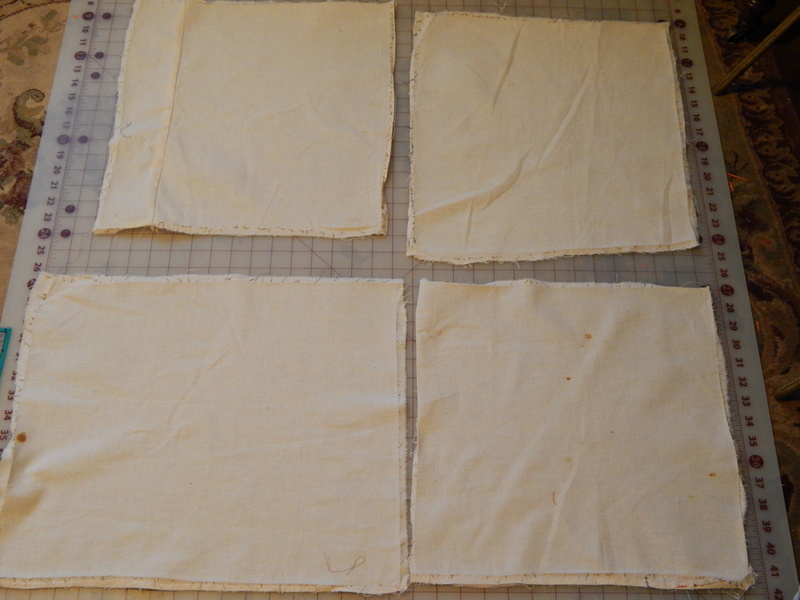 The borders were pretty bad ….they were not cut straight and so they are very wavy and uneven. If I took them apart and trimmed them and sewed them back together I would have lost a lot of size. I decided to leave it as it is and just cut out the extra length. The seller stated that the top was about 80″ x 84″ in reality it was 74″ on top, 84″ on the bottom, 99′ on the left, and 94″ on the right. 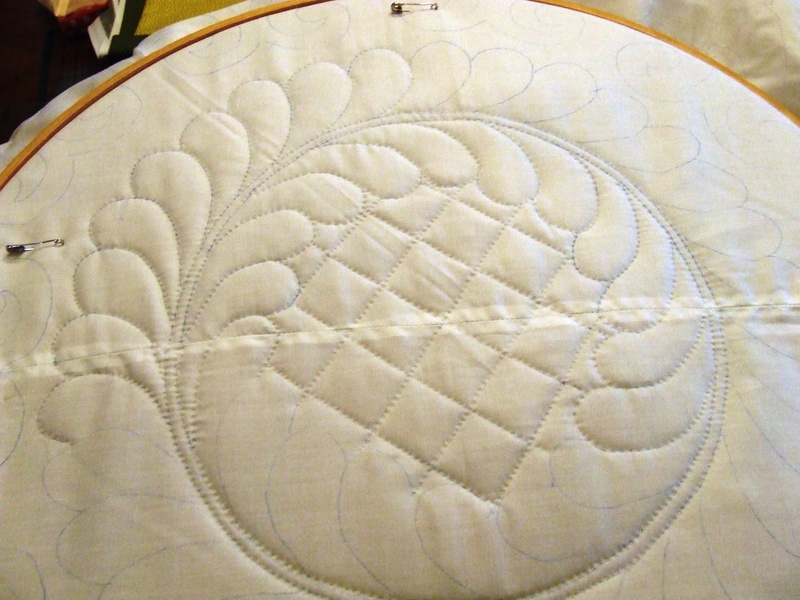 It will be a while before I get to hand quilting it, but now it is ready. Amazing as always! And Mrs. Barron would be proud! I am so glad you showed us the parts of this quilt. Those “triangle” setting pieces! 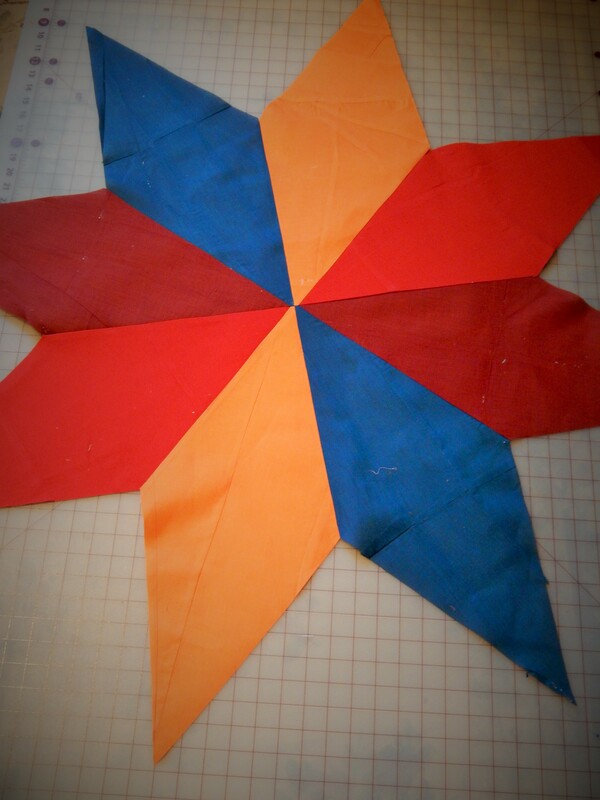 When I first saw it, I wondered if the maker started with a six-point star and tried to cram in the extra color. This really is a salvage job that proves your craft! 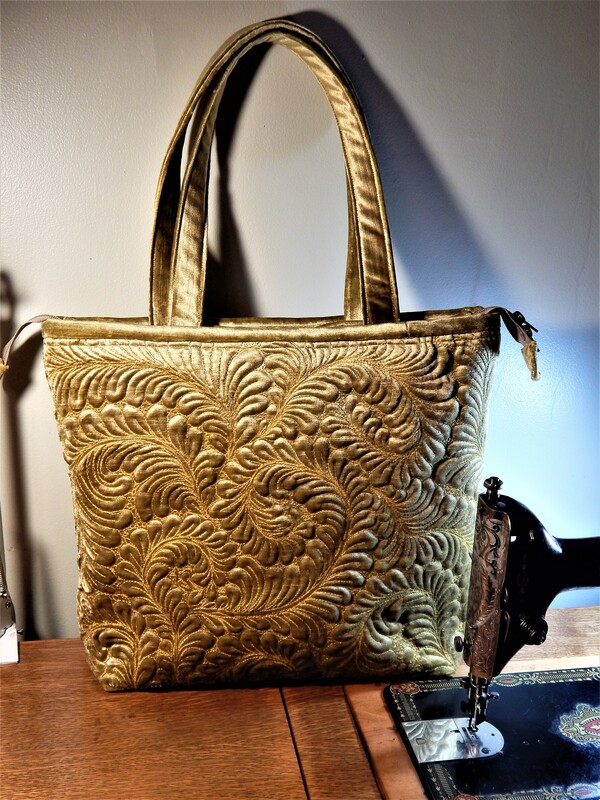 Thanks Gaye…..I hadn’t thought of that but it makes sense that the maker felt like an extra color would look god and crammed them in..
You are amazing! I would not have the patience to figure out and repair all the problems in the original quilt, but the results are fabulous! Who says high school math/geometry is useless!? (I still have my doubts about quadratic equations, though, LOL) What fun to see you figure out what was wrong and show us how to fix it!! I agree with everyone else about the setting triangles—-sheesh! But now it is all fixed and it will be fun to quilt with all the open areas!! Im with you on quadratic equations! 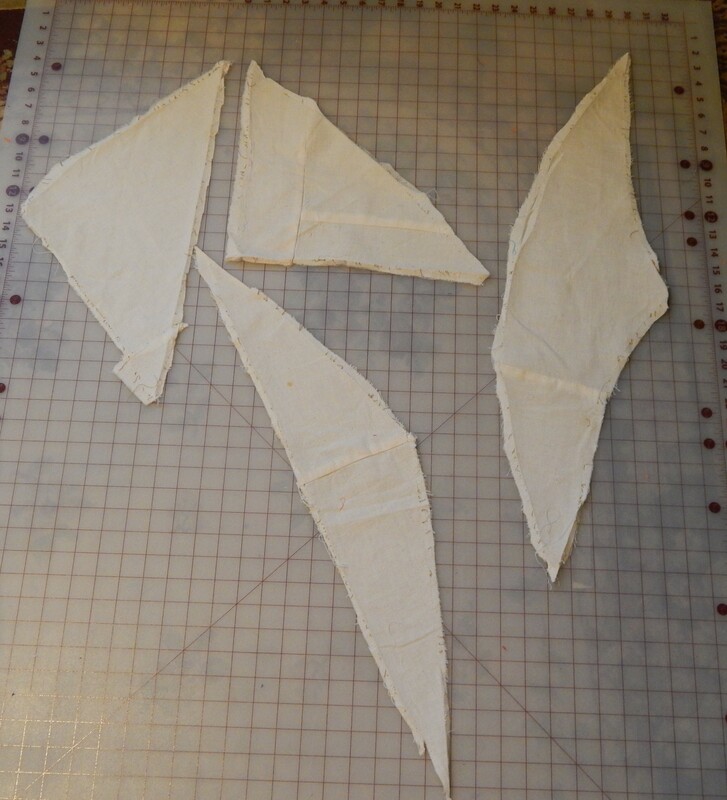 I think the shapes were definitely the weirdest in any quilt I have worked on….i did laugh at them myself….but you have to give the maker points for effort! 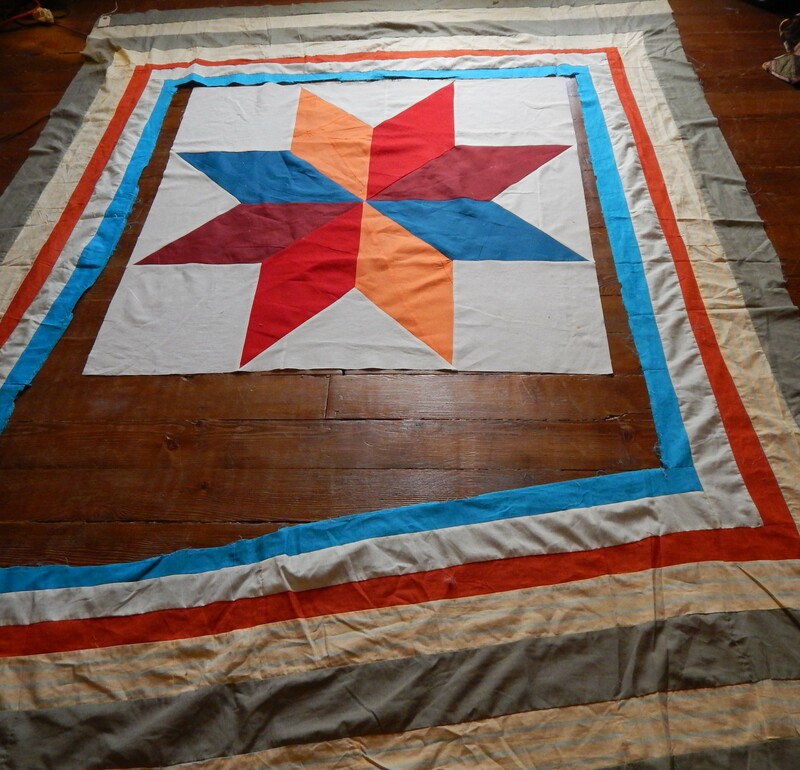 As others have said, thanks for sharing the process of how you save these old quilts. i love to share these projects! You, Tim, are a genius…a patient quilting genius. It is great that you saved this top. I would not have had the patience. I would have started from scratch. It is a simple yet striking design. Great step by step explanation! That is amazing! You have a great vision for diamonds in the rough. You deserve a medal! It will be a great quilt, what an eye you have. A new life for that top. Teddy has met his match in quilts — this was a rescue top. And proof that rescue tops can make good quilts. Rescue a top today! Fantastic job Tim, another quilt saved for posterity. I wish the maker could see it now, you have realised her dream! Wow! Forget blogging, time to write a book! Don’t listen to Bill, don’t forget blogging – just write the book while you sleep. Did you chuckle just a little at the measurements and the sheer wonkiness of this top? Because I confess I did (and not in a mean way). I might have even hummed the silly quilt song “You Can Quilt That Out” https://www.youtube.com/watch?v=XzoL7ddTEnA while I was reading your post. Isn’t it amazing what a little precision cutting will do? So glad you saw the potential in this one and made another great save. Still in awe in Nebraska. Wow! It was a lot worse than I expected. You did a great job straightening it up, and now that star is gorgeous. Great save! Great job!!! Your math teacher would be ver proud of you. Wow Tim!!!! It looks so wonderful now!!!! Can’t wait to see it quilted!!!! Who says miracles don’t happen any more? 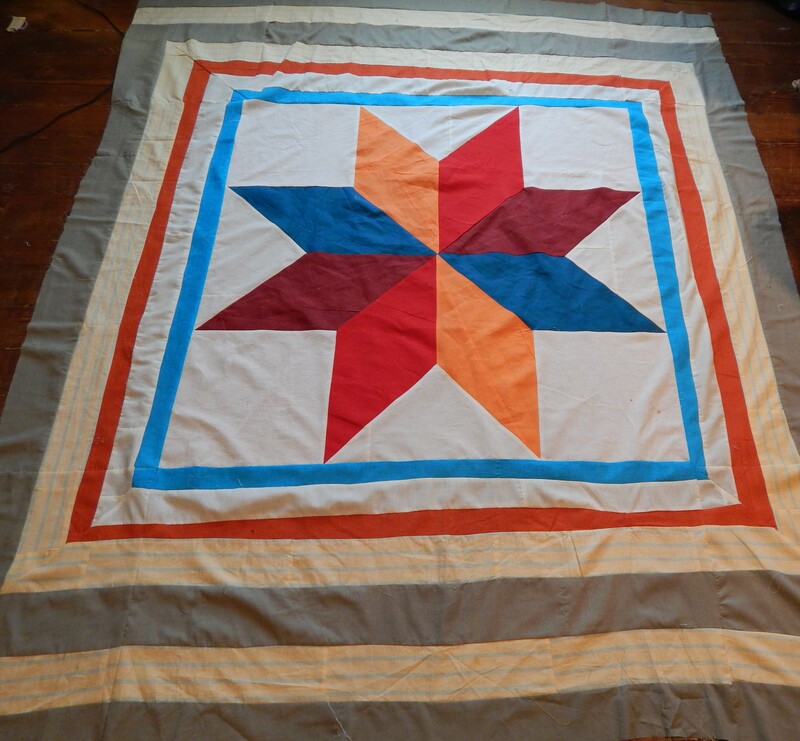 Good job the quilt was simple in design, because it has allowed you to take it apart, correct it and reassemble it in fairly short order, which makes for a very interesting post. 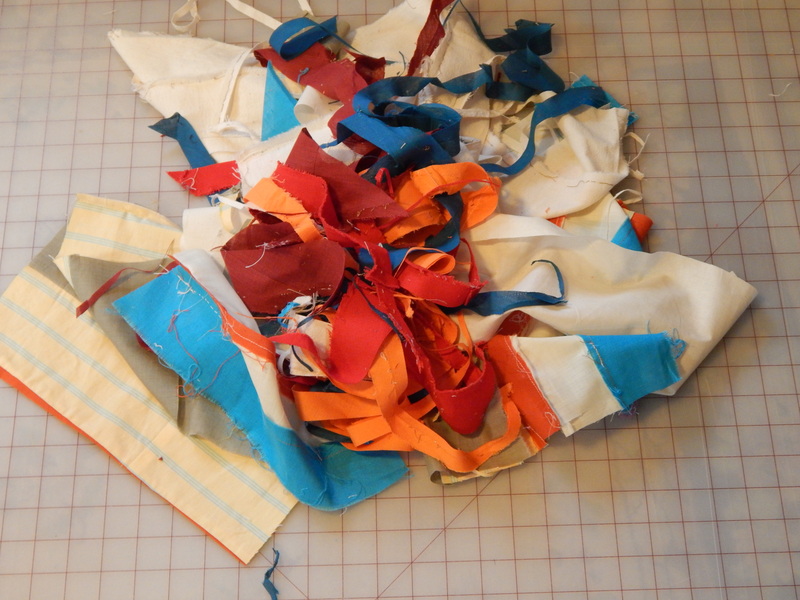 It looks like a lot of scraps that you’ve had to cut out, but they were never meant to be there anyway, so it’s OK! Hah, how about that for your book title? great! i love that title.. thanks! Bravo to you for your patience in fixing these old quilts! So happy they are going to such a good home! You have worked your magical mathematical method on another wonder! 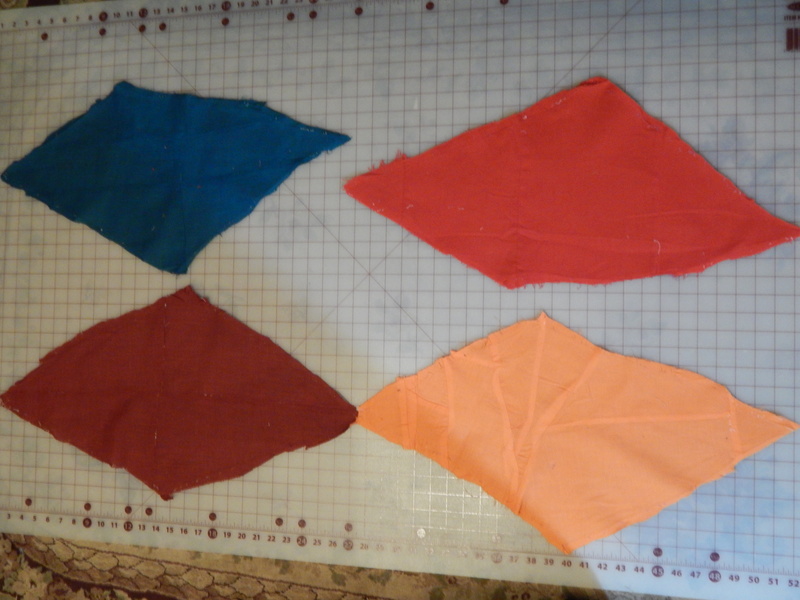 Laughing about the setting “triangles.” It will be even more remarkable once you’ve finished quilting it. Looking forward to that! Wow….that quilt fell into good hands! I also commend you for your vision! Most of us would have taken a pass! You did an amazing rescue job with this piece. Good work. That was absolutely fascinating. 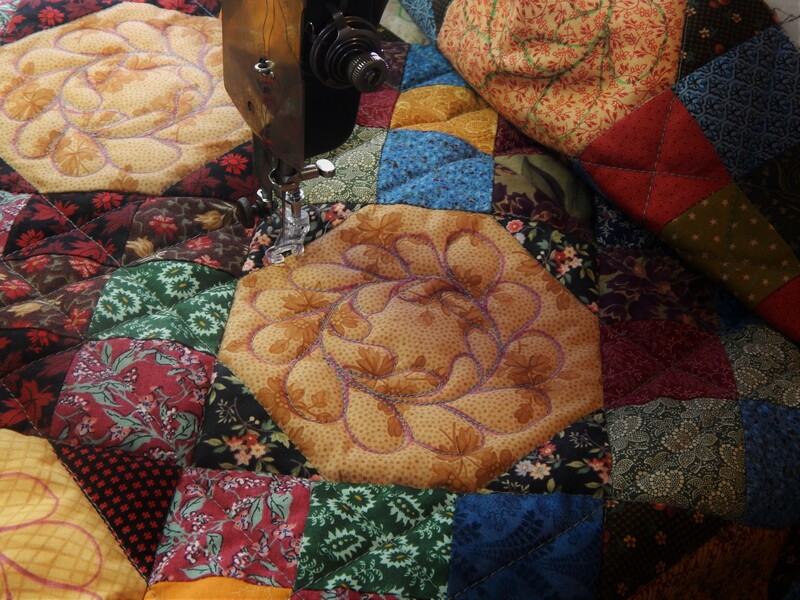 These sad sack old quilts are lucky to have you to rejuvenate them! It really is a striking design,now that you can see it the way it should have been! Another lost quilt has been rescued! You did a fantastic job on this one Tim! There must be an interesting story behind this quilt top, especially those odd shaped pieces that were supposed to be ‘triangles’! What a great fix Tim! You really are the Quilt Rescuer! 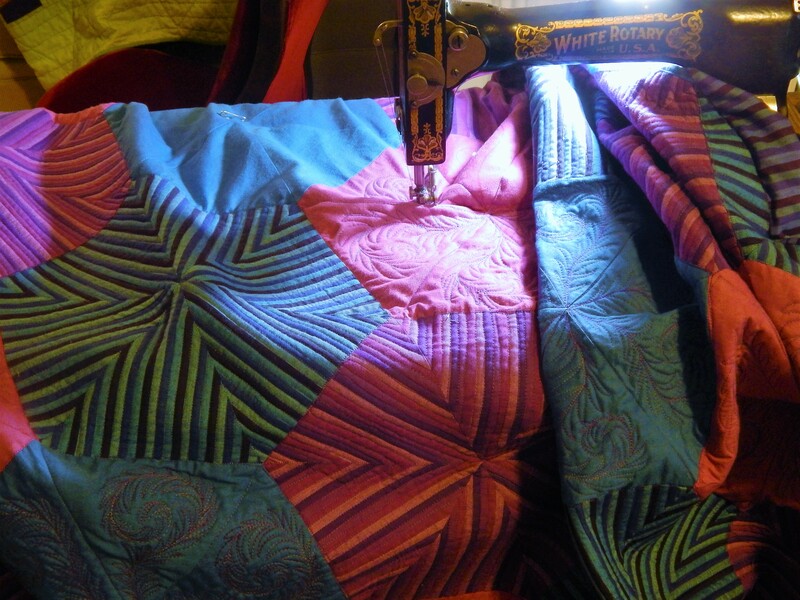 What I admire about your projects is the way no quilt is ever beyond help! Its a great star. A book of your projects and how you overcome problems would be brilliant. That was a lot of work but it turned out just beautiful. 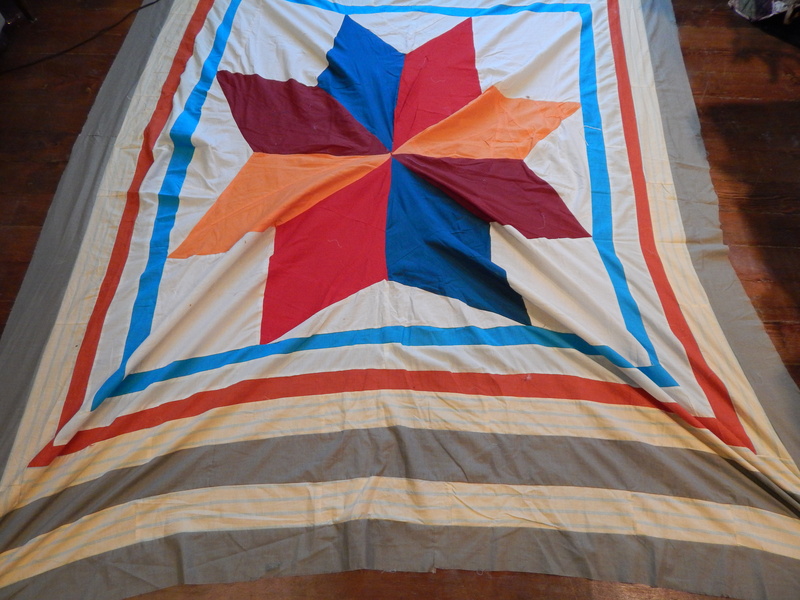 Your vision for these old quilts is what makes them special. Have fun quilting it! Thanks Pat…..it might not be able to wait for long…..I really should finish at least one more before I start another…..but ……. I wish the original maker could see the result of your work on her/his project. How disappointing it must have been,after all that effort, to have an unquiltable top. I’m very glad you were able to save this piece. Thanks. It is easy to look at these and laugh at the missteps but I think you are so right….it much have been very disappointing to not be able to make it to the finish line. And a good blog writer with great images to explain what you are doing. Keep up the good work. What fun! Now you have a really great quilt. I can hardly wait to start quilting it! i love your reports on all those quilting fixer-uppers…you r very talented in your craft and very studious and purseverence in all that you do…do you hand sew all parts together? also love your flower gardening..how do you ever find the time to do all that you do?? Thanks Bobbie! Math teachers sure had a hard job with me…..but so glad they stuck with it 🙂 Teachers are special people! !